Well here we are almost in December of a year that ended up going in a very different direction from how I had envisioned it at the start! Isn't that the way sometimes? Different doesn't necessarily mean bad, but it does (at least in this case) mean changes, one of them being that I have ended up spending a lot less time in front of my computer this year. I have spent more of the time when I could've been online making things instead and when I have wanted to share them with the world I have thrown a quick post up on Instagram rather than spend several hours writing a blog post. But I don't want to give up on this blog totally and there are definitely some things that I feel deserve or need a "proper story" rather than a couple of quick snaps. I am going to try and get these stories on here. In the meantime if you would like to see what I am up to on a more regular basis please come join me over HERE on Instagram (there is also a link at the top right hand side of the page if you are viewing this on a computer). Another (very) recent development is the opening of my Etsy store! I have hummed and hahed about opening one for a while now (would anyone be interested in anything I make? what would make my stuff stand out and be different? can I handle all the techy side of an online business?) but in the end, with Hubbie to help me with the techy stuff, I have just decided to take the plunge. So what will you find there? Well I hope it will be a reflection of what you find here, a variety of cross stitch, knitting, and crochet. If I write an original pattern I plan to have it available as a pdf download so you can make one too, and there will also be some knitted and crocheted items available as gifts. To kick things off here is the story behind the first item in my store. Hubbie very kindly painted the bare wooden sleds black for me and I mounted my stitching on black card before attaching it to the top of the sleds. Didn't they turn out cute?!! The designs stitch up pretty quickly, in about 2-3 hours, and I'm giving these two away as gifts as well as making some for our house. I had a lot of fun designing and making these so I'm going back to Hobbycraft to get some more sleds and going to have a play with a couple more designs! In the meantime if you would like to stitch these for yourself you can find the instantly downloadable pdf HERE . To celebrate the opening of my store I'm offering these two designs plus tips on stitching and finishing them for just £1. Happy stitching! Hello! Is anybody still there?! I'm sorry it has been so long since I posted, especially if you are a new follower - you must be wondering why you hit subscribe! After making the advent calendar for his older brother a few years ago (which you can see here) I had been thinking of how to make one that would look right on the wall next to it. I sewed the cross stitched designs onto white felt pockets and used brown, red, and white felt, ribbon, and buttons from my stash to turn it into a Gingerbread House! The original cross stitch design by Cheryl McKinnon was published in a back issue of Cross stitch Crazy magazine but it is also available here if you want to stitch these cute little motifs for yourself! ...and here it is on our bed where it has been pretty much ever since! So by the end of March I had finished two of my UFO's and two of my new projects but since then I have struggled to keep on track with this challenge. After a lot of deliberation I have come to the decision that while life is throwing so many other struggles and stresses my way I need my crafting time to be about relaxing and going with the flow. I need to work on what I feel like picking up right now rather than something put on a list back in December. If this means some UFO's float around for a bit longer so be it, it's not the end of the world. I'd like to thank Meredithe and Anne for organising both this and last years' challenges - I have cleared a whole bunch of UFO's since the beginning of 2017 and also worked out a lot of the reasons things become UFO's round here in the first place so hopefully I won't create so many in the future! 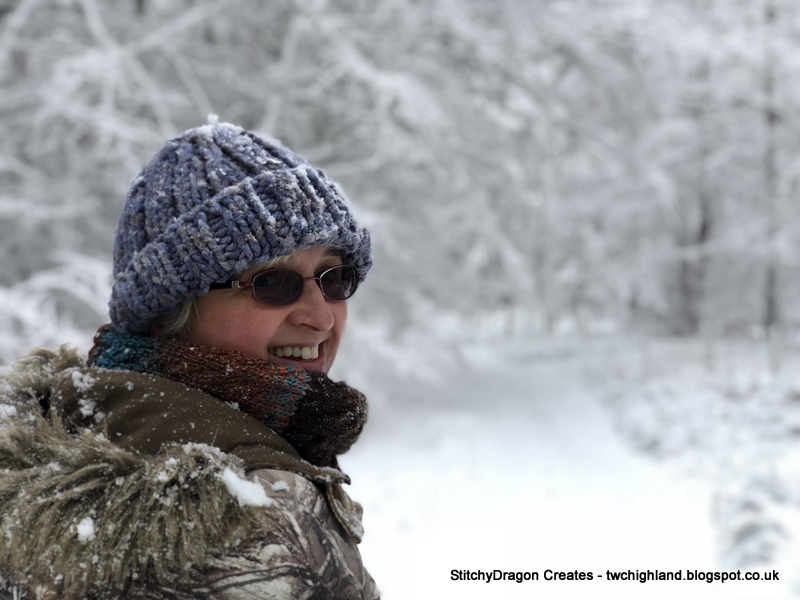 Do pop over to the Linky to see what other folks have been working on this month, I hope to be back soon to show you what I've been up to recently... Wishing you a lovely and creative week! I'm still loving working on this, it saw quite a bit of progress while the Winter Olympics were on, and it's been lovely and warm to snuggle under as I make my way down the ripply rows. I hope to get them properly finished off and the advent calendar completed over the coming weeks. Partly spurred on by how chilly February was I decided to tackle another UFO from The List, number 6, the snuggly snowflake mittens. After making a lot of measurements and notes I pulled out everything I had knitted last year, picked different yarn, different needles and made a fresh start. I chose a variegated sock yarn from my stash (Rico Design Superba Bamboo in colorway #9) and a dark brown solid sock yarn that had the same fibre content (Premier Yarns Deborah Norville Serenity sockweight). Following the notes I had made from my last couple of attempts I managed to adapt the pattern to fit me at last!! They were pressed into immediate service and I only remembered to get some photos after I'd been wearing them every day for about 10 days! ...but more about them next time too! Thank you for visiting me here today, I hope you have a lovely week whatever you are working on! Well here we are at the end of January so it's time for an update on the 6&6 in 2018 challenge. For this project I picked a rustic 14 count aida to stitch on from my stash that I bought a while back from a seller on Ebay. The packages were labelled as 12" x 12" so I had hoped to use the last two full pieces but when I squared them up they were only 11.5" so, as I need 3" squares for each design, I will only fit 9 on each piece. I had a bit of a panic looking out the other offcuts of this aida and checking I have just enough to fit the other 6 designs on! Then I gridded the pieces up, forgetting to switch out my usual fabric marker (a Frixion pen) for a water soluble fabric marker. It didn't even occur to me until I was working on the bigger piece of fabric and wanted to iron it - doh! heat removes Frixion pens so if I iron it all my lines will disappear! I am going to iron them all off and regrid the other bits of fabric with the water soluble marker before I start stitching the next one... But apart from this slight snafu I have really been having fun with these, they are the simplest stitching I have done in quite a while and each new motif is like starting something new so I haven't been tempted away by a "proper" new start. I know it will be worth it when it's done but I will never ever be tempted to stitch on black evenweave again!!!! Well those are my 6&6 projects which have seen the light this month, please go on over to The Linky to see what everyone else has been working on. Thank you for visiting with me here today, I hope you have a lovely creative start to February! I was especially happy as the night before I finished my new scarf! ...and there has been some other stitchy stuff going on around here but I think that needs to wait for my next post. Thank you for visiting me here today, I hope you are keeping warm and dry wherever you are! But this did leave me with a bit of a problem. I really only had enough of the sparkly yarn for a scarf, not for a matching hat, and I couldn't give one sister a hat and scarf and the other one just a hat! (Who's my favorite?!) I was also past the point of where I could've made the scarf into a cowl (and I'd already discovered there was no pulling back with this yarn!). Back to the stash... now this is when you find you have four different shades of lilac but none of them match and don't even get me started on how many shades of "white" there are!! In the end I found two tiny balls of the same brand but in a dk weight for the lilac and the white and was able to match the burgundy to some Stylecraft Special (it matches better in real life than in a photo). I adapted this pattern for the different weight and hope I can get away with the hat not sparkling? Do 13 year olds pay that much attention anyways?! So two presents down and a little less yarn upstairs! I have named it The Colors of Scotland Hat and am almost finished writing up the pattern. When it is done I will add it to the free patterns tab at the top of the blog in case anyone else would like to make one. Despite having measured both boys thoroughly I was a little nervous as to the fit of these (especially as I altered the sleeves from the pattern to match the measurements I had taken) but when they put them on on Christmas Day it was all good! They have proved a big hit with the boys so I think I might be making some bigger sizes in the future! So would you like to see the whole blanket? Here it is in all it's stripey gloriousness!!! It finished up at 66" by 50" which is a good size for a person to snuggle under on the couch these chilly winter days! Thank you for visiting with me today, I hope you have a lovely weekend whatever you are working on! Black Christmas cross stitch decoration - last one in the set of four to finish. Little knitted hedgehog - knitted three or possibly four? years ago needs put together. Sugar Plum Fairy - knitted three? years ago needs assembled. The wave cross stitch - started June 2011, saw substantial progress last year can I get a finish this year? Snuggly snowflake mittens - started here they really deserve to come out of that time out and get finished now! Woodland Blanket CAL - since Lucy's first post about this I have been dying for this to start! Advent calendar for Little C - after making this advent calendar for his big brother I have been meaning to get started on one for him. Moab blanket - I have been playing with yarn pegs and an idea since April last year to make a blanket inspired by one of my favorite landscapes and using Lucy's Cosy Stripe pattern. Of course I am going to start lots of other new things over the course of the year - there is not a sock in sight on either of those lists for a start! - but I would really love to have all 12 of these projects completed by year's end so am going to try and prioritize these. Thank you for visiting with me today, I hope you will come back often in 2018 to see how I'm getting on with this?! By the way it's not too late to join in if you like this idea!! Hello! Thank you for stopping by! I'm Helen & I'm mum to three young people and gran to two little boys. I was raised "making things" & have retained this love of creation all my life. I live in the beautiful Scottish Highlands where I can usually be found cross stitching, sewing, quilting, crocheting, or knitting. I also love reading and being outdoors. I hope you enjoy your time here & come back & visit with me often! All blog content & pictures are owned by me, please respect copyright & don't use them without asking first - thank you!